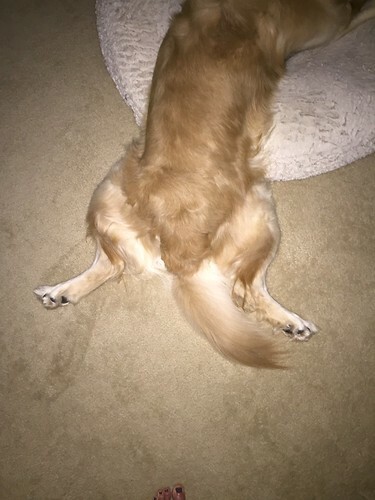 Today, I give you Frog Dog! He was stretching and grumpling this morning, flopped over his bed, and one of his favorite stretches is Frog Dog. This pose always cracks me up, so I thought I'd share it with the blog today! 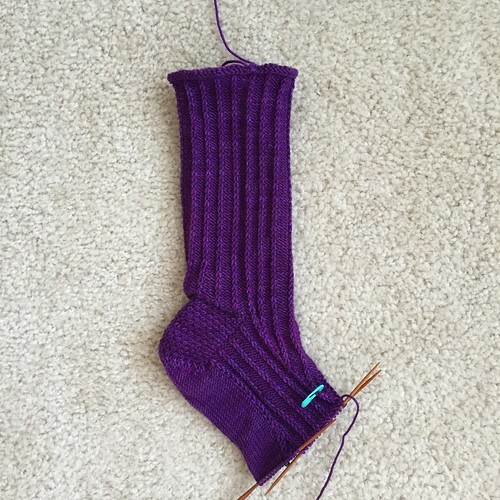 This past spring, one of the Loopy Academy requirements was to knit a pair of socks. I chose a pattern but paid attention to the pattern chatter on the Loopy Groupies board on Ravelry, because you never know when you'll find a new sock pattern. 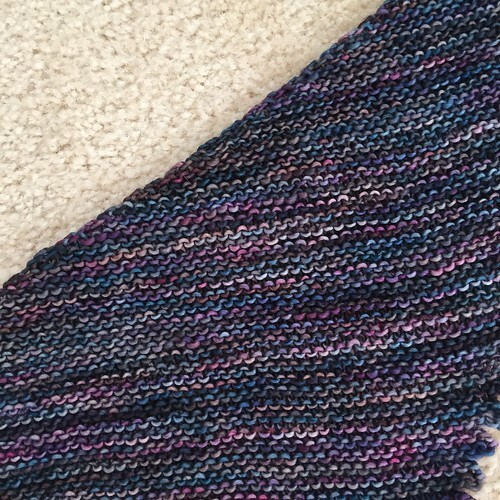 Several of the other knitters knit the Simple Skyp pattern and seemed very happy with it. 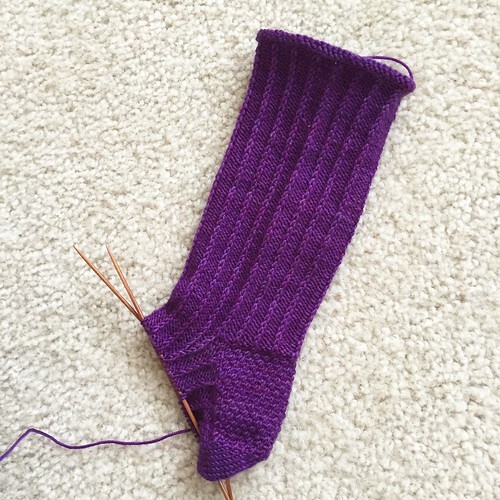 One of the things I'm trying to watch for is patterns I can use for Mickael (and Caleb once his feet stop growing), but I've learned the hard way that I prefer simple patterns for a such a large sock. 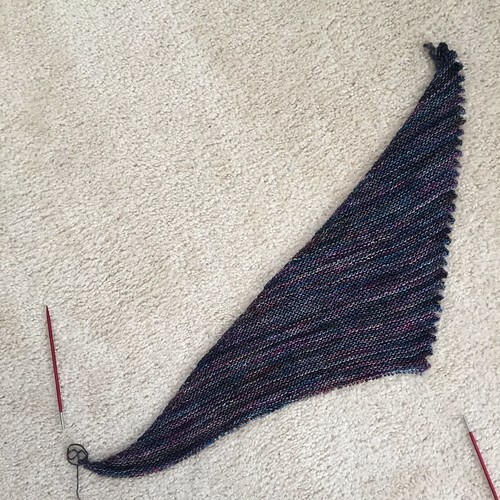 The Simple Skyp pattern looked like it would fit the bill, but I decided to give it a test drive on a pair of socks for me, before I commit to knitting acres and acres of sock. 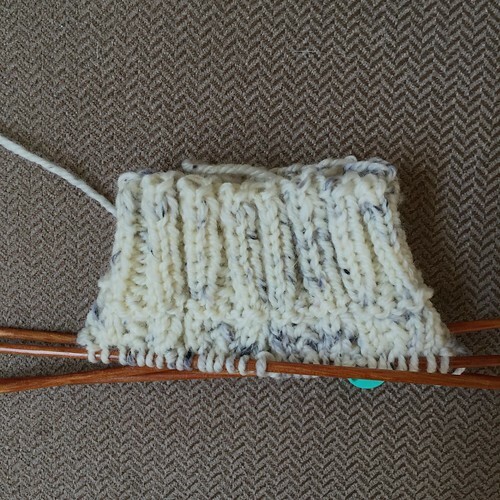 I'm using Madelinetosh Twist Light in Birch Gray and I've just barely gotten started on the main pattern. I'm pretty sure this will definitely work for man socks. It is an easy pattern - easy to memorize and easy to knit - and the couple of repeats I've worked, I've enjoyed. I'll finish my socks before I cast on for a pair of manly socks, but I think this is going to work! Also, I realize that you can't see the pattern at all on my photo because I just haven't gotten far enough. 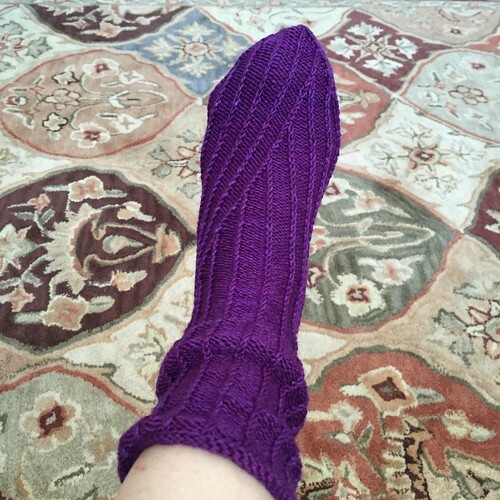 If you click on the link to the pattern in the first paragraph, there are pictures of finished socks. Sorry, just realized I'm babbling on and on about a pattern and my own photo shows you nothing about it. Once the sock is bigger, it will be easier to see. Another Pink Sweater, As Promised! I cast on for a new pink cardigan this weekend! I actually cast on for three different sweaters, but the first two didn't work. The first plan was to knit a cardigan, but I couldn't get gauge quite right. 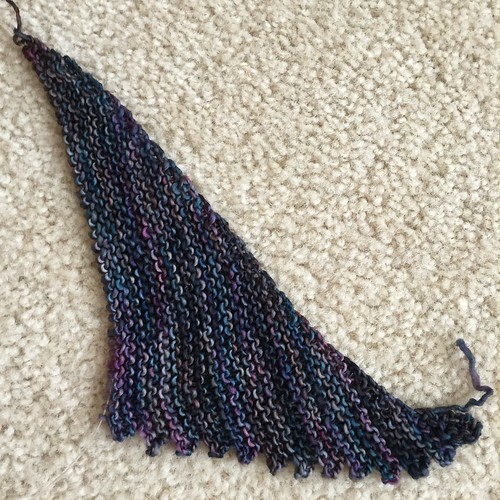 This was one of those rare patterns where you have to have both stitch gauge and row gauge, and I couldn't get the two to match up. Then I cast on for a pullover and was knitting along happily, right up until I realized I didn't have enough yarn to actually finish it. So, I started over again. For my third attempt, I went back to a tried and true pattern - Featherweight Cardigan. I've knit three of these (one was a gift), and they are in pretty regular rotation in my cooler weather wardrobe, so I know another one will be useful. I'm knitting it in Madelinetosh Tosh Sock in Pop Rocks. I'm using the pink needles again, it's living in the pink bag, but just to mix things up, I'm using blue stitch markers (they're hidden in the roll in the photo). I can't become predictable! Here's a close up so you can see what's going in the darkness of the Musas colorway. This shawl has a definite fall or winter feel to it, but even in the dark color that is Musas there are is a bunch going on. Have a great weekend! 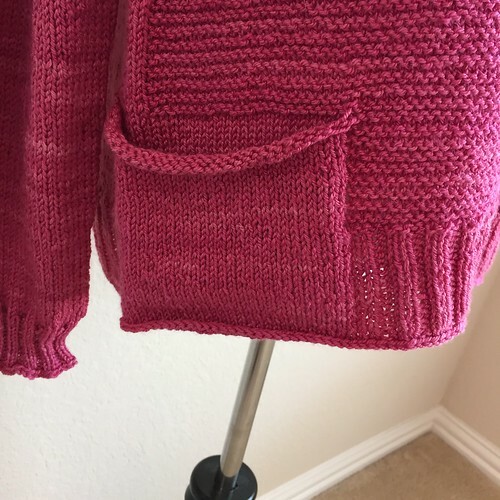 I'm going to start a new pink cardigan! I've finished my Twisted socks, and I would like to note that I knit one left sock and one right sock. This project could have very well ended with two left socks, but I kept things straight and knit one of each. I love the finished socks and I think they're very pretty with the twisted ribbing. I knit them in Blue Moon Fiber Arts Socks That Rock Lightweight in H.R.H. Crown Princess of Purple, Violetta. The pattern is Twisted, from Knitty several years ago. This was my third attempt at this pattern. The first one was a lighter weight sock yarn and they were going to be a little bit tight. The second attempt was with a yarn that was too variegated for the pattern (sometimes slipped stitches work with variegation, not this time). This time, everything came together and I'm really happy with my finished socks! I have knit all the way through the Musas color on my Cameo, so no more stripes, and that means lace! The lace edging to this shawl is super simple, but adds a nice texture to it. The Sandbank color reminds me of antique linen and I love the way it pairs with the dark tones in the Musas. I actually ended up running out of Musas earlier than I was supposed to, so my Cameo has fewer stripes than the pattern calls for. Fortunately, this is the kind of pattern where it's easy to start and stop the different sections without having to do complicated math types of things to get the sections to fit together. I enjoy not having to do complicated math type things! Also, just a note, I still haven't cast on for my next pink sweater! I'm being such a good PinkLemon finishing other things first, I should get an award! We won't discuss the two giant, honking blankets waiting for me to get back to them, shall we? I've gotten a lot done on the right sock for my pair of Twisted socks. I'm past the heel turn and I've decreased the gusset areas and now I'm working to the toe. For such a simple stitch pattern, there's a lot going on with this sock as the stitches twist across the toe. I love the look of it and it's very pretty on the foot, but this is not a portable project at this stage of the knitting. Yes, technically all this effort will be inside a shoe, but I tend to run around barefoot or sock footed most of the time anyway, and besides, I'll know how pretty my socks are! You Look Like A Pink Nightmare! 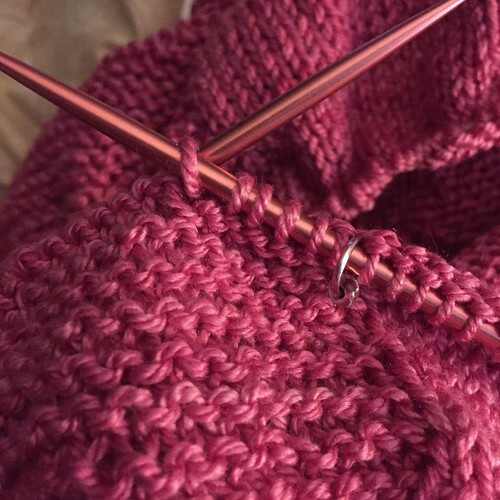 What happens when you knit the Pink Memories pattern in pink yarn on pink needles with pink stitch markers? You get a Pink Nightmare, but in a good way! It's all finished and waiting for cooler weather now. This was a fun and fast knit. 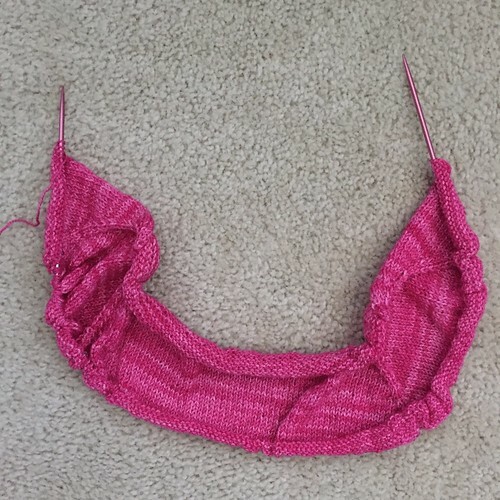 I'll probably do it again at some point (maybe with less pink, but no promises), but I'm thinking about doing the front in seed stitch instead of garter stitch. I find that my gauge is similar between the two, so it might work. 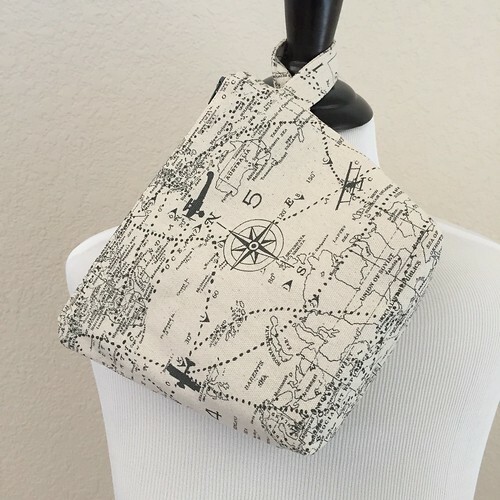 I think the pocket is so cute and really makes a simple design more interesting. 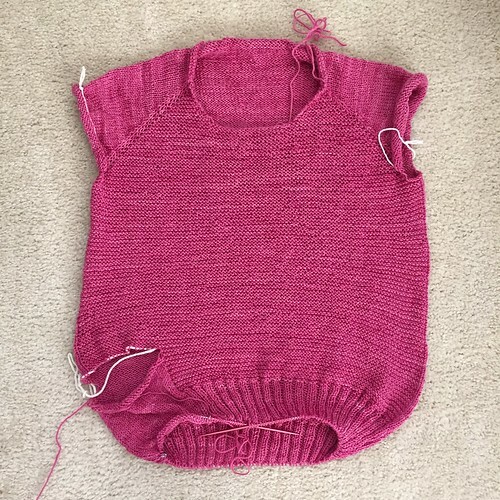 You'll be proud to know that I have not yet cast on for my next pink sweater, but the pattern is in knitCompanion and is about 98% set up, so it's only a matter of time before I cast on. 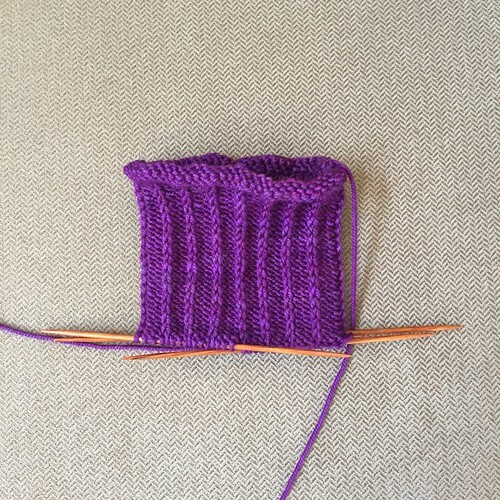 I finally got started on my second Twisted sock. I kept intending to cast on for it and I kept putting it off, but now it's started! The right sock is different from the left sock, so that the twisting is mirrored. (I've already knit the left sock, this is the right sock.) There's not much exciting happening until after the heel, but for now this will be nice TV knitting! 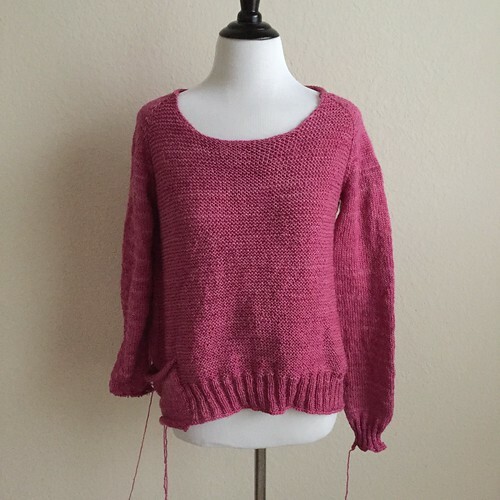 I've finished my Pink Nightmare, but it's blocking and can't come to the blog right now. I've already picked my next pink sweater to cast on, but I'm going to try to get some work done on this sock, and my shawl, and I really need to work on my Carson throw, and then there's the crochet blanket that I haven't picked up in ages, and to be honest, the operative word in this sentence is try. Maybe I can wait until tomorrow to cast it on. Either way, I've got plenty to work on this weekend! I finished my first sleeve and have gotten quite a bit done on the second sleeve! Once I finish this sleeve, all I've got left is the neck band, sewing the sides of the pocket and weaving in ends. Since there are no stripes and I only used two balls of yarn*, there aren't that many ends. I hope to have this finished by the end of the week. 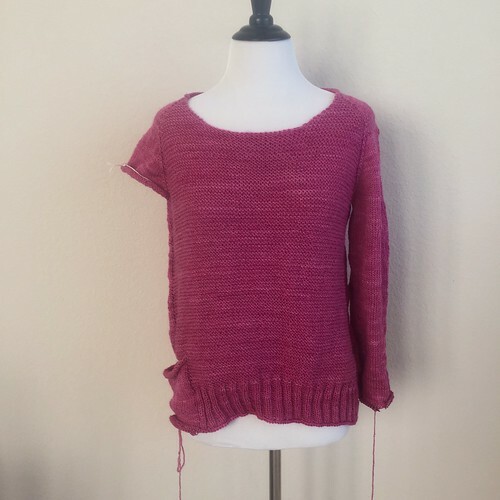 Remember last Friday how I had a theory that if I measured the sleeve length at the underarm on my raglan sweaters that I could just knit the sleeves without trying them on? Well, I measured and they range anywhere from 17 inches to 19 inches. Those were just the ones by this designer. I had two Ravellos with two different sleeve lengths! Clearly that theory wasn't really worth much. On the other hand, if I'm ever stuck somewhere with only a sleeve to knit and no convenient way to try it on, if I shoot for around 18 inches finished, I should be fine, so maybe it sort of worked. You know, for sleeve emergencies and that sort of thing. *The yarn is Tess Designer Yarns Silk and Ivory which has 150 gram skeins with 675 yards per skein, so two balls of yarn for a sweater! Also, I didn't have to alternate the skeins - they match! I've made it to the striped section of Cameo! 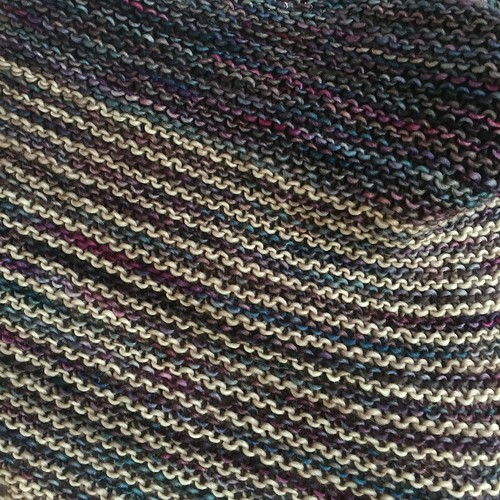 I'm using the colorway Sandbank for the stripes (still the Malabrigo Mechita base), which is kind of a taupe color. I'm planning on striping until I run out of the Musas color and then I'll work the lace section until I'm out of Sandbank. This will make my Cameo a little bit bigger than the pattern, but I won't have little bits of yarn leftover either. That's my plan anyway. I've completed the body to my Pink Memories and I'm more than halfway through with the first sleeve. I'm at the point where I need to try it on to see when to start the ribbing, but I think I'm pretty close. This morning I realized that I really should know the measurement for my sleeves at least from the underarm of a raglan style sweater. Sometimes the neckline is more open or closed with a raglan, so measuring sleeve length from the neck might not be too helpful. My underarm is pretty much always in the same place though. I've noticed that it does tend to stay right under my arm! I think this might be a good measurement to know because sometimes I can't just strip down and try on a sweater-in-progress to check sleeve length. I've tried holding it up to my body and that doesn't really work either. I think later today I'll get out some of my sweaters and do some measuring! Yesterday I sat down to the sewing machine and I sewed! I made a car caddy organizer (for the car). I thought this might help corral some of the little things in the car that tend to sink to the bottom of the center console and disappear. The sewing was pretty straight forward and the tutorial was very clear. Once again, my Wonder clips made everything super easy to keep straight. 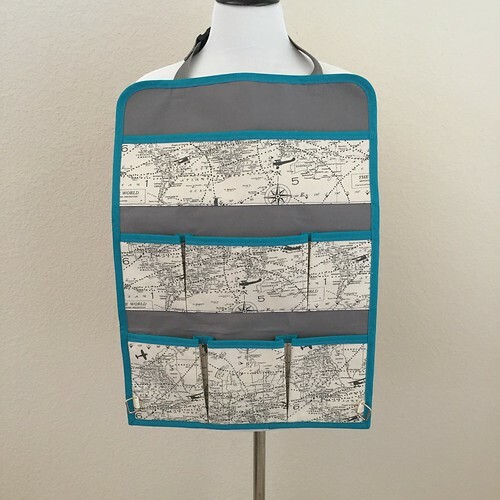 I've found that these are wonderful for heavyweight bags and accessories. I don't use them for garment sewing because they do add some weight and I don't want things to be stretched out. I think I sewed the pleated pocket sections differently than the instructions said to (I maybe didn't pay attention to the instructions at that point very well). I also decided not to use the giant grommets for the lower anchors and just added some tabbed rings. I'll tie the bottom edge down with some paracord. I had some scraps leftover and a spare zipper laying around, so I made a little zipper bag as well. 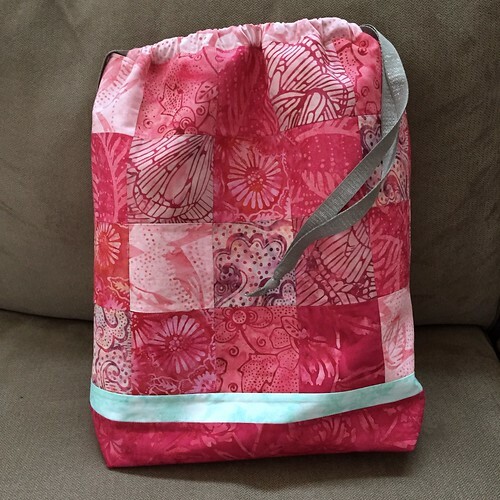 This is kind of a mashup of several different bag patterns I have and the measurements were based on the size of my scraps. I like the fabric, it reminds me of of Indiana Jones and while the bag is not big enough for knitting, it will hold other things just fine. That's probably good because Caleb has already walked off with it. I have gotten some more work done on my Cameo shawl. 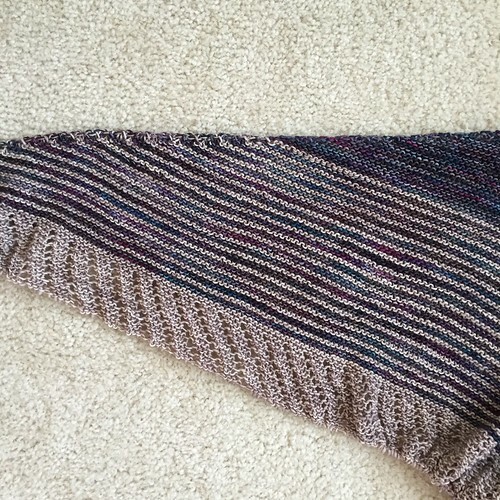 There's something very relaxing about this kind of shawl. 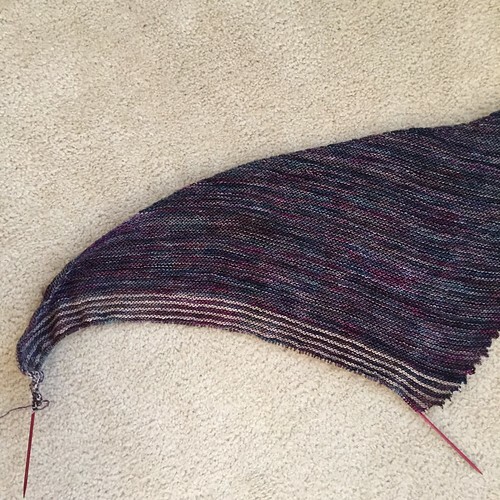 Once you know what's going on with the shaping, you can just knit and relax and watch the shawl grow. The yarn is Malabrigo Mechita in the color Musa and in some ways it reminds me of a dark Lotus (also a Malabrigo color), but there's a little more going on in the Musa. It's actually a bit darker and richer than it looks in this photo, but it's difficult to get the color quite right. It's an interesting color that will work really well with my fall and winter wardrobe. Speaking of seasonal dressing, does anyone else look at the models styled for "summer" with the big piles of scarves wrapped around their necks and wonder why? Where are people wearing these kinds of things in the summer, Siberia? It is possible that Texas isn't the market for such things in the summer, although in the spring and fall, I could see it here. 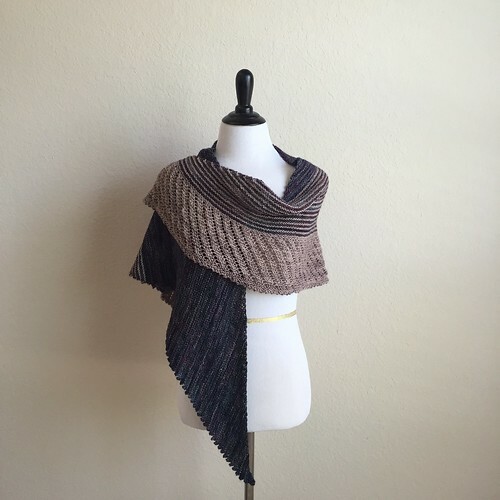 Even with as cool as this spring and early summer has been so far, I still feel no urge to wrap a large scarf/shawl/cowl around my neck several times. I have no idea what this discussion is about, it just popped into my head and I shared. You're welcome. I'm just about finished with the body of my Pink Memories/Nightmare! The stitches for the pocket lining are on the holder and I'm working on the lower body ribbing. There's just enough going on with the garter stitch front to make things slightly interesting, but not even approaching complex. This is great TV or conversation knitting. Also, every time I see the pink yarn on the pink needles with the pink stitch marker and think about how the pattern is called Pink Memories and that I'm keeping the whole thing in a pink bag, it cracks me up. Silly giggles! I can't help it, I'm loving this project! I finished my first Twisted sock! This is one of those designs that's so simple, but really pretty. I love the way the twisted stitches wrap around the foot, and I'm so much happier with this design in a handdyed solid than I was in a multicolor. I still haven't started the second sock, but I hope to get that on the needles this afternoon! I've passed the heel on my Twisted sock and the foot twist is beginning to develop. If you look just to the left of the heel flap, you can see one of the ridges is starting to travel up and across the instep. This is the left foot (there are separate directions for left and right feet), so the line that's starting to travel will be on the outside of the foot. I'm hoping to get this first sock finished over the weekend and at least get the second one cast on, but I'll have to put down the pink project first! Have a great weekend! Since I've just finished two wraps, I not only cast on the Pink Nightmare, but another wrap! I bought the yarn for this about a year ago (I think) so now that I've begun the Summer of Stash, I've cast on! The project is Cameo and the yarn is Malabrigo Mechita in Musas. This is the first time I've used this colorway and I'm loving the dark, moody colors. I'll be using Sandbank as my contrast color - it's kind of a taupe color, but I didn't think to get a photo of it. Once you get a feel for the pattern, it's definitely autopilot knitting. I'm actually farther along than it shows in this picture but that's because I took the picture yesterday when the sun came out briefly. Then the rain moved back in and I can tell that there's no point in trying to photograph this color on a dark, rainy morning. Maybe that's what Musas means in Spanish? I basically sat down and started playing with the squares leftover from the blossoms until I had a reasonably sized bag shape, and then added a pale turquoise stripe and a solid piece for the base. It's lined with more scraps and I found a sparkly, gray twill ribbon for the drawstrings. Now I have a pink project bag that is big enough for a sweater. 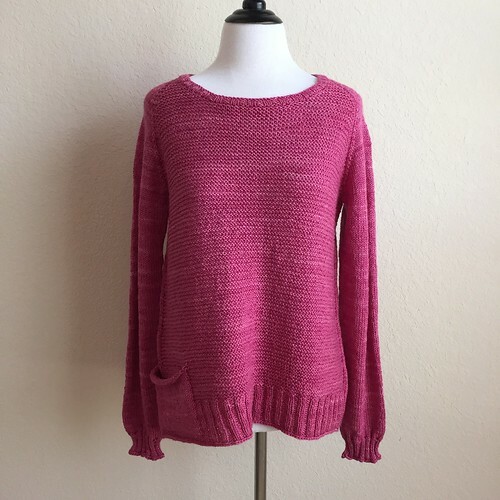 While I was in the sewing room, which desperately needs a good reorganization and straightening, I saw that I have pink yarn in my stash for at least four more sweaters. This bag was clearly essential to my pink knitting! This may be the summer of pink sweaters! Brace yourself!